HSBC says it has processed "99%" of payments affected by an IT glitch, with the remainder due to be completed overnight. Earlier, the bank said 275,000 payments were hit by the problem, meaning many people were not paid on time ahead of this weekend's bank holiday. 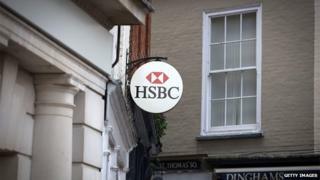 HSBC apologised for the inconvenience caused to customers. It said it was "committed to ensuring that no one loses out as a result of today's unacceptable problems". "Customers who do not receive the delayed payment by Saturday morning should speak with their bank in the first instance," the bank said in an earlier statement. "They should also contact their bank if they have suffered any costs as a result of today's problems," it continued. The fault meant that it was not just HSBC customers who were affected, but also customers of other banks who were expecting payments, such as wages, from HSBC accounts. One HSBC customer, Sam Clarke, told the BBC that none of his 120 employees in central London had been paid. "There's been very little or no valuable communication from HSBC. It's turning into a nightmare as the hours roll on with no word," he said. Mathew Robinson, an accountant at a language translation company in Hove, East Sussex, also said none of his staff had been paid today, including himself. "It's also a problem for our suppliers - we have over 100 suppliers and they're not getting payments from us," he said. "HSBC have been appalling in handling this situation." Mark Eddy of Interlink Scaffolding said that wages payments had left the company's account, but not reached employees' accounts. "We now have 150 irate scaffolders," he said. Media captionHSBC customer Linn Boo should have been paid today: "Now I've got a late mortgage, all my utilities come out... I haven't got any money"
HSBC is understood to have contacted the Bank of England over the problem, while the Financial Conduct Authority has also been made aware. Bacs, the system used across the UK to process payments, said it was aware of an "isolated issue" affecting one of its members. "The Bacs system is operating as normal and we are currently working with our partners to help resolve this as quickly as possible," a spokesperson said earlier. Which? executive director Richard Lloyd said Friday's problems with HSBC would do little to reassure consumers that banks were making improvements to their IT systems. "It's essential regulators continue to take tough action to ensure banks properly maintain the payments system we all rely on and we expect HSBC to fully compensate anyone affected," he said. Andrew Tyrie, chairman of the Treasury Select Committee, said he would be writing to HSBC's chief executive for assurance that no customers would lose out from the failure, as well as to ask what would be done to prevent it happening again. "This appears to be yet another serious IT failure by one of the major clearing banks," he said. "It is increasingly clear that most, if not all, of these banks' IT payments systems need a good deal of investment, and there is a lot to put right". In June some 600,000 payments failed to reach enter the accounts of RBS customers. In November 2014 RBS was fined £56m by regulators for a 2012 software issue that left millions of customers unable to access accounts. RBS, NatWest, and Ulster Bank customers were affected in June 2012 after problems with a software upgrade. Sam Walker, of Thurrock in Essex, said he had been unable to pay bills: "I have to tell people I rent from why I can't pay them. I'm just thinking of all the people who have direct debits set up for mortgages and rent. "I'm meant to be meeting people over the bank holiday weekend. I've got the week off, I can't do anything at the moment. It's terribly disheartening." Linn Boo, of Huddersfield, is facing fees because funds did not reach her account as expected. "I've had a text messages saying that I'll get charged overdraft fees - as my direct debits come out of my account on pay day," she told the BBC. Have you been affected by this glitch? You can email haveyoursay@bbc.co.uk with your story.